I read Treasure Island because I liked Dr. Jekyll and Mr. Hyde so very much. To be quite honest, I really don't know what else Stevenson wrote. I'm still willing to read something else of his, but my enthusiasm is waning after the pirate tale. Ok, so I also read Treasure Island because there seems to be a big return of All Things Pirate and I suppose this was my attempt to sort of jump on board with this new (old?) popular fad. I've avoided Pirates of the Caribbean (because, frankly my dear, I just did not enjoy the first one and I loathe Johnny Depp). But I thought -- I thought -- I could enjoy tales of pirate treasure via Stevenson. I was just too Arrr Matey (!) for me and therefore just not my thing. Speak the King's English, please, and be quick about it. The slurring, the back stabbing and the grayness of life in general just didn't click for me. It's not that I am after dancing, laughter and merriment. (After all, isn't that the happy life of pirateering?) It's just . . . too dark and grim. On the one hand I found it quite the divergence from Jekyll and Hyde, and on the other, it still had a very dark tone to it. Not at all the little Disney mini series I remember watching of Captain Long John Silver. Oh well. I tried it and I will admit to failing it. Again, if you have another Stevenson suggestion for me, I'll give it a go. This one just wasn't for me! Now see, I loove all things Robert Louis Stevenson. I can understand the dialog can be a little much though, I have to be in that particular mood. Kidnapped is good. I have a book of prayers that he wrote on his Samoan island. The natives there loved him and he was a loved part of their Christian church. I actually love Johnny Depp. He is a crazy enigma of a man but a decent sort. Have you seen Chocolat? Juliet Binoche is the leading lady and the musical score is Rachel Portman who does the Gweneth Paltrow "Emma" score. I think you would like it. I also loooove the first "Pirates". I haven't seen any of the other ones, I loved it before it was the THING. I do not do mainstream! Oh, say it isn't so! Pirates was my major outlet this summer! (And perhaps last summer as well...) After a hellish semester and the work I knew was still ahead of me, it honestly kept me afloat. But to each his own. I like Treasure Island, but it honestly reads too much like a children's book for me now. I enjoyed Kidnapped much more; it has a far greater dialect challenge, and the story is considerably more complex. The Curse of Treasure Island by Francis Bryan is a sequel that may be better than Stevenson's original. 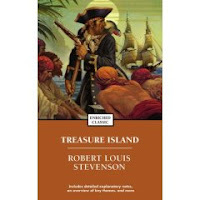 I read it last summer and really enjoyed it - and I read Treasure Island 20 years ago to my son, but haven't reread it.